(TORONTO, ON – APRIL 6, 2016) Explore the future of the Lexus brand and immerse yourself in luxury design, technology and performance at the 2016 Edmonton Motor Show. Most prominently featured at the Lexus display is the Lexus LC 500 – an all new, premium luxury coupe making its Canadian debut and setting the bar high for its competitors. The LC 500 is built around an all-new, premium rear-wheel-drive luxury platform – part of a new global architecture for luxury vehicles (GA-L). The bodywork combines aluminum, carbon fiber and high-tensile steel to reduce weight and lower the centre of gravity. 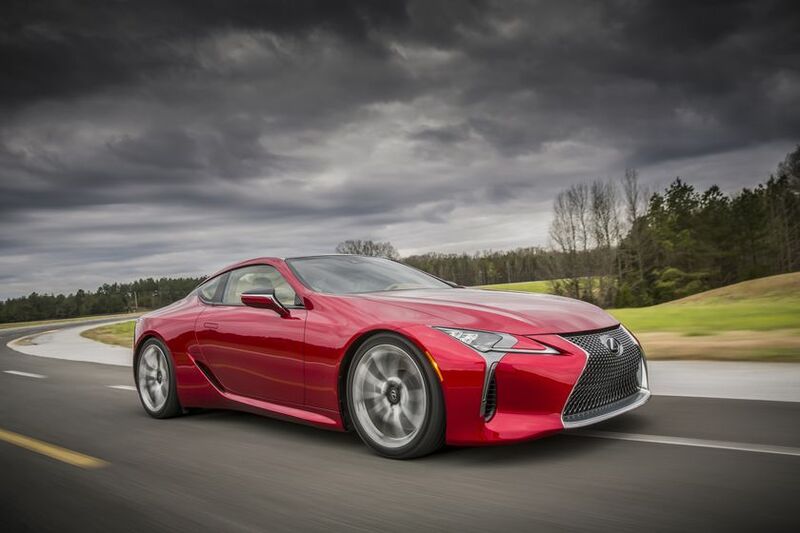 But what’s immediately apparent is the avant-garde styling and dynamic coupe proportions: the LC 500 is seductive and glamorous, yet also athletic. Inside, the LC 500 combines all the elegance and sophistication of a Lexus premium coupe with careful attention to quality and comfort. The LC also debuts an all-new Lexus Multimedia package and features top technologies – including Lexus Safety System +. What’s promised in style is also delivered in performance, starting with the perfect balance achieved by new suspension and steering systems. And it’s built around the same powerful, high-revving 5.0L V8 that’s at the heart of the Lexus GS F and RC F high-performance luxury models. What’s more, the LC 500 will be joined by the LC 500h hybrid edition when the LC series arrives at Lexus Dealers next year. This is the year that the GS gets the “F” series treatment. The all-new 2016 Lexus GS F combines world-class, track-proven speed and agility with the opulence and refinements of a four-door luxury sedan. As with the RC F coupe (also on display in Edmonton), this latest addition to the Lexus F series of high performance luxury sports cars was tested and proven on some of the most challenging racetracks in the world. Lexus offers more choice than ever before, with new models joining the 2016 lineup – including the Lexus IS 200t and Lexus IS 300 AWD in the popular IS series entry luxury sedan line, and the Lexus RC 300 AWD in the RC series of luxury sport coupes. It’s now easier than ever for Lexus guests to find the perfect balance of power, performance and efficiency. Several Lexus luxury SUVs received major updates for the 2016 model year. These include the Canadian-built RX 350 midsize luxury SUV, the RX 450h hybrid luxury SUV, and the flagship LX 570. New style, new performance and new technologies combine luxury and comfort with remarkable versatility and go-anywhere capability. The 2016 lineup features several updated models, including the ES 350, ES 300h, GS 350 AWD and GS 450h, plus the NX 200t and NX 300h compact luxury crossovers. All of these – along with the entire Lexus portfolio – will be on display in Edmonton, as will several advanced Lexus technologies. These include a virtual reality simulator that lets visitors race a Lexus over a realistic, 3D interpretation of the Fuji Speedway – the “home track” for the Lexus F series of high performance luxury automobiles. Lexus Canada is the exclusive Canadian distributor of Lexus luxury cars and sport utility vehicles through a sales and service network of 38 dealers across Canada. Guests have access to a wide range of luxury vehicles with a total of 12 Lexus nameplates available in Canada, including the largest luxury hybrid lineup of 6 hybrid models. Lexus is committed to, and inspired by, great design – a passion for product, initiatives and events that represent “Amazing in Motion”. The Lexus RX 350 and RX 450h are built at Toyota Motor Manufacturing Canada’s (TMMC) award-winning Cambridge South plant. For more information about Lexus products, and Lexus’ pursuit of perfection, visit: www.lexus.ca.